(CNN) -- Marco van Basten has quit as Ajax coach after the failure of the Dutch giants to qualify for next season's Champions League. 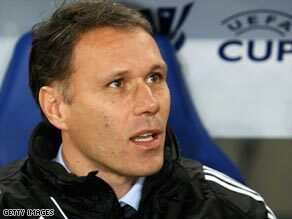 Ajax's failure to qualify for the Champions League has resulted in Van Basten leaving the club. The 44-year-old took over at the Amsterdam Arena last summer with high hopes, but has departed after less than a year of his four-year contract. Ajax lost 4-0 at Sparta Rotterdam on Sunday with Steve McLaren's FC Twente beating new champions AZ Alkmaar to clinch second spot in the Dutch Erevidisie. The results left former European champions Ajax in third place and a place in the lesser Europa League next season. Basten could not hide his anger at his team's performance. "How in God's name is it possible that we cannot defeat Sparta when we have to?" he said after that match. "I had much faith in a good result, but again the team seemed scared. We did not succeed in getting the team ready. That is very annoying and surprising." An Ajax statement quoted Van Basten as saying he had failed to meet his goals as coach and felt that he would do no better next year. He appeared to have the backing of club director Rik van den Boog, who insisted "sacking Marco van Basten is not a point of discussion at the moment". However, after talks between the coach and the board, Van Basten decided to resign, claiming he could not see how he could improve things next term. "I don't have the idea that I can do better in the new season," he said today. Van Basten's assistant John van't Schip will take charge for the final game of the season, at home to Steve McClaren's Twente, on Sunday.